You know how good the fries smell at a fast-food restaurant? You can savour that amazing aroma at home with these easy grilled fries. Line disposable foil pan with crumpled nonstick foil. Spread fries onto bottom of prepared pan. Place pan on barbecue grate. Grill 15 to 19 min. or until fries are heated through, stirring after 10 min. Serve with ketchup. For best results, keep barbecue temperature at 450ºF. 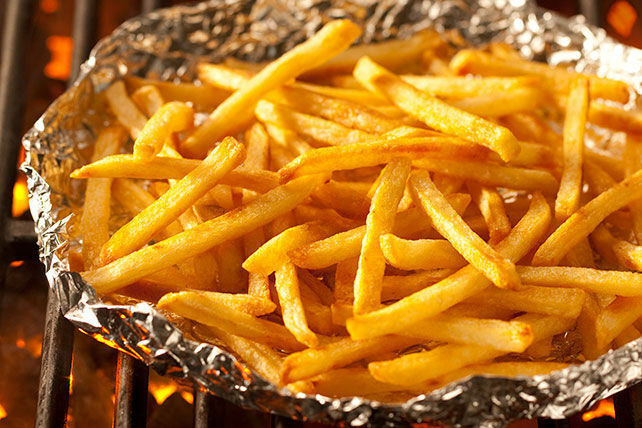 Higher temperatures can cause the fries to burn, while lower temperatures can increase the grilling time. Since barbecues heat differently, keep an eye on the food as it cooks on the barbecue to prevent it from burning. If necessary, adjust the grilling temperature to maintain an even temperature.